Some people might wonder what a stretch class is like Not the difference between yoga and stretch, but what a stretch class is like, what we do in class. I am sure all stretch classes are a bit different. My feeling is that basically you want to stretch the entire body. Different bodies are going to have different needs. Someone might have really tight hamstrings and perhaps need a lot of stretches that stretch the hamstrings. Some people might have tight calves and need a lot of stretches that stretch the calves. Someone might not have chronically tight triceps, but might need a good stretch for them because they used them a lot the day before. So there might be some people with specific needs, but everyone can usually use a full body stretch. 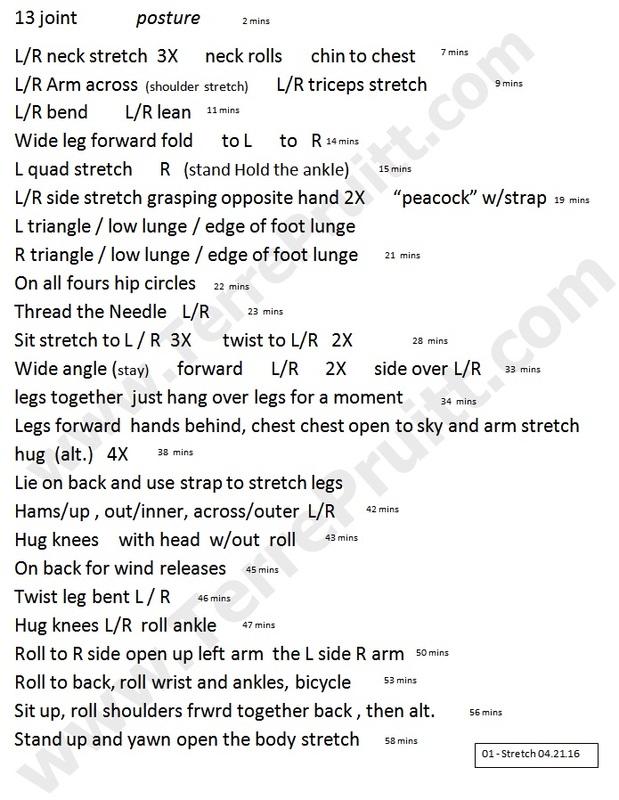 So I thought I would share a stretch workout we have done so you can see what a class might be like. As with a Nia class that has a “map” of seven cycles consisting of setting your focus and intent, stepping In, warm up, get moving, cool down, and floorplay, in our stretch classes I use the body. I basically go from head to toe. We just start at the top and work our way down. Sometimes we do some middle work in between because I want us to be standing and it is what we can do standing. Or we might do some foot stretches while we are seated in the beginning, but generally I like to work from head to toe. The “13 joint” in this sample the Nia Thirteen Joints Exercise. That is just one way to get the 13 major joints moving. “Posture” is just us setting up with a long spine for the movements to come. The “bend” is where we are standing and we keep our weight evenly distributed over each foot and bend left then right, closing one side and opening the other. Then the lean is where we shift our weight to get a stretch. “Peacock” is what I learned the movement as, where you clasp your hands behind your back then fold over and let your hands fall over your head to the earth. I cannot remember where I learned it as that, but that is what I call it. The “on all four hip circles” is being on all fours and moving your hips to the left, back, right, then forward, then reversing and going the other direction. Hug (alt.) is literally hugging yourself with one arm on top then switching so the other arm is on top. Great way to open the shoulder area in the back. “Wind releases” are hugging one leg to the chest then the other. We hold each stretch about 30 seconds. Sometimes it might take us longer than anticipated to get into a stretch or I might see some really uncomfortable people, so I adjust. If someone walks in with an obvious issue or states something or has a request we can switch things up. It is very flexible. Ha, ha, ha. That is what we are working towards. Any questions? Care to join us? Care to try this at home? This entry was posted on September 23, 2016 at 9:39 pm	and is filed under Misc. Tagged: Nia class, Nia Thirteen Joints Exercise, stretch calves, stretch class, stretch hamstrings, stretch triceps, wind releases. You can follow any responses to this entry through the RSS 2.0 feed. You can leave a response, or trackback from your own site.